presents a concert program with an acoustic duo combined with electroacoustical sounds and backgrounds. We think this is a perfect choice for concerts and festivals that present Contemporary Jazzmusic. The Duo has a great experience of doing Jazzconcerts in art galleries, culture centres, modern museums, churches, live radio and chamber music concerts. Susanna Lindeborg started her professional musical career at the late 70th. From her classical upbringing she turned into work with jazz and improvisation, which showed to be her right element. The thing you first think of together with Susanna Lindeborg is her work with the mix of acoustic and electronic instruments, which has been known most of all through her own group Mwendo Dawa. Mwendo Dawa has been succesfully touring in 23 countries in Europe, North and South America and China performing at Jazzfestivals like Montreux, Northsea and Montreal. 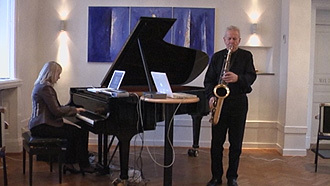 Today you can also hear her in the Lindeborg/Johansson Duo and Natural Artefacts and she is also performing solo doing a improvisational performance together with her computers doing electroacoustical backgrounds. Susanna Lindeborg writes her own music and some of this got profiled when she released her first soloCD 1989. Ove Johansson´s musical work stretches all the way from straight ahead, free form and electronic jazz to the acoustic and electroacoustical mix of today. He has been able to present his music throughout the world- both in Europe and North and South America and China, and he has produced 32 albums with his own material and with the group Mwendo Dawa. The style of Ove Johansson has always been very personal with a powerful and intense performance and a rare sound and technique. He is always in the frontline according to new music. From being active in teaching saxophone and improvisation at the Music Conservatory in Gothenburg during the 70th and 80th, he has since 1989 started his own record label LJ Records to present his own and new Scandinavian jazz music internationally.